When I received this DVD through the post from Christine at Spellbound Bead Co, I had to restrain myself from putting it on straight away, especially when a quick glance inside told me that I already had the beads I needed in my stash! However, I managed to put it away until this Easter when I knew I would be spending a few days in Devon. I packed up my computer and a selection of beads, thread, beading needle and scissors (tassels are the perfect projects for beading on the move!) and as soon as the rain arrived, I dived in! The first great thing about this DVD is that the accompanying booklet has a list of the supplies you'll need to complete the designs included in the video tutorial. This means you can gather together everything you need before you've even put the DVD into the player. You'll need beads suitable as the focal or tassel top then a selection of smaller beads for the tassel strands. 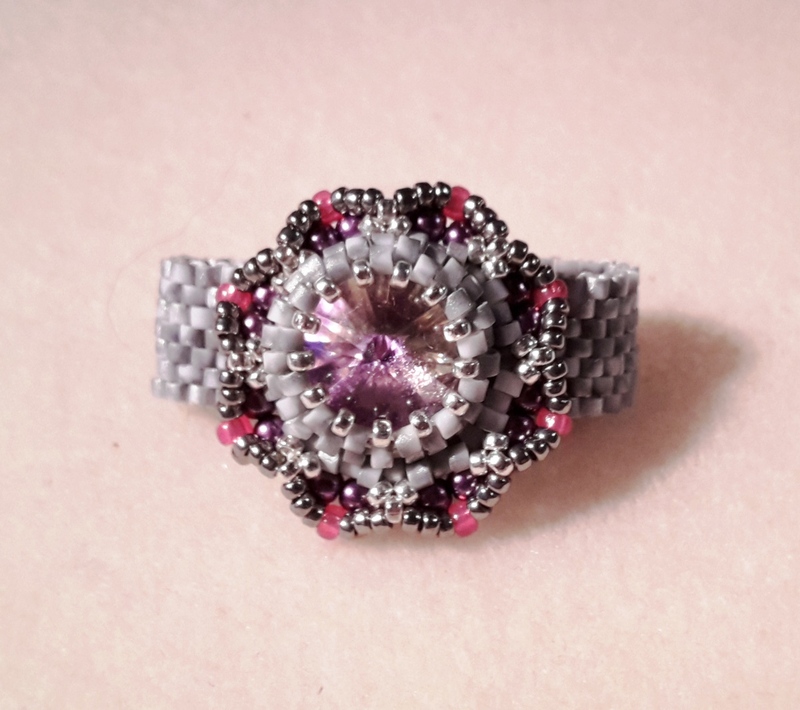 I used a range of size 6/0, 8/0, 10/0 seed beads in shades of purple, pink and grey to complement the beautiful lampwork bead I'd chosen from Ciel Creations plus some lilac bugle beads and Hex beads to add a little sparkle. 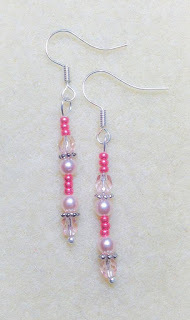 Instead of the recommended fire-polished faceted beads, I used some Czech glass Cathedral beads. Julie Ashford takes you through selecting beads at the start of the tutorial, showing you how to pick out colours from your chosen tassel top beads and the right beads to choose for weighting your strands. 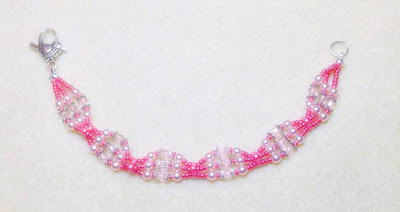 She then shows, at close quarters how to thread your beads to create a series of identical beaded strands (including some clever little tricks to keep your beads in place and to avoid testy tangles in your thread!). Following Julie's clear and simple instruction, you will quickly work to make your own first tassel. Once you've mastered the easiest design, Julie will take you on to discover more ways to finish your tassel ends and also, how to create textural branched strands. I warn you, you will be hooked! This DVD doesn't just cover tassels! 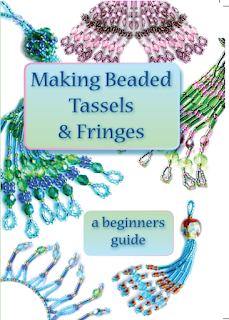 You will also learn to make pretty fringed necklaces and also how to incorporate tassels with ribbon to create your own beaded trim to use in your home made cushions and throws. PLUS, Julie covers some beautiful beaded beads using a couple of techniques for creating luxurious tassels that you could use as curtain tie backs or other home décor accessories. The sky is the limit once you have learned the techniques. The instructions and demonstrations in the DVD are so clear and comprehensive, I only needed to watch once to be able to go away and create my own simple tassel. I will certainly be referring back to the video to make the more complex tassels and to have a go at beaded beads in the future. 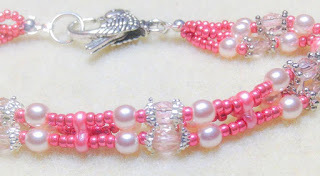 Whether you are a beginner beader or are familiar with small beads, you'll learn something new from Julie. 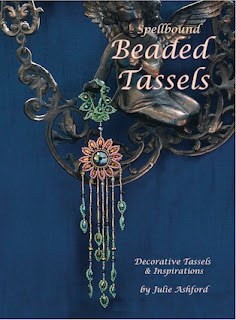 And if you want even more tassel-tastic fun, then why not get a copy of Julie's book 'Spellbound Beaded Tassels' which will take your new tassel techniques up to the next level. Both the DVD and the book are available from Spellbound Bead Co. The DVD is just £9.95 and the book is £14.95. We have a copy of the DVD to give away to one lucky fan! To be in with a chance of winning, simply comment on this post an tell us your favourite colour combination for a tassel.Look out on our Facebook page for another opportunity to enter! We'll pick a winner at random after midday on Friday 29th April 2016. 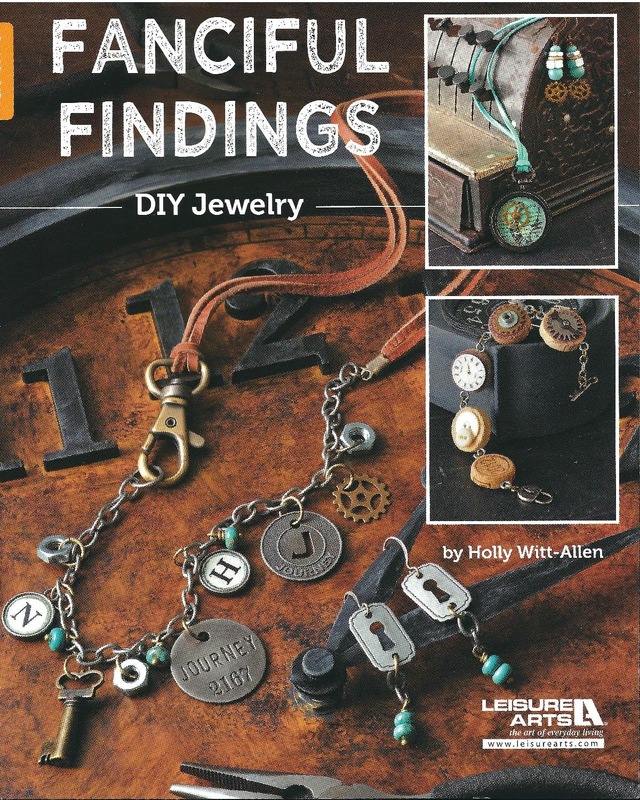 This is more a booklet than a book, but it is still 32 pages full of ideas and inspiration for using unusual objects in your jewellery pieces. 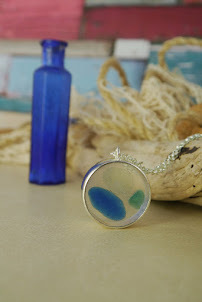 In all, there are 22 projects for designs ranging from standalone bracelets to matching necklaces and earrings, all using recycled/upcycled components, or materials that look like they are! Those who like to take a mixed media approach to jewellery making will love the techniques used in this book. 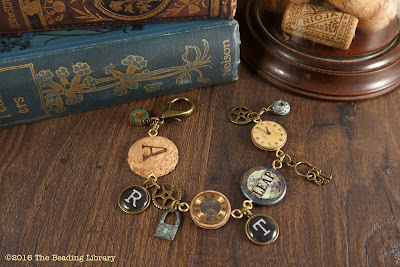 You will have opportunities to use rubber stamps, découpage and dimensional finishes in some of the pieces alongside more conventional knotting and linking techniques. Whilst some projects will require you to search out unusual components such as hex nuts or hinges, others can be made using items you’d easily find at home including ring pulls from fizzy drink cans, bottle tops and corks. In addition to these ‘found objects’, you’ll also find ideas for using pseudo second-hand components often found online at scrapbooking and papercraft suppliers. 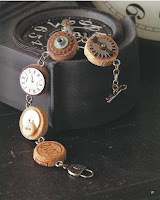 Tim Holtz Ideology® range is a particular collection that springs to mind. With the addition of metal patinas, paint or paper, Holly will show you how to transform run-of-the-mill supplies into unique components and quirky designs. 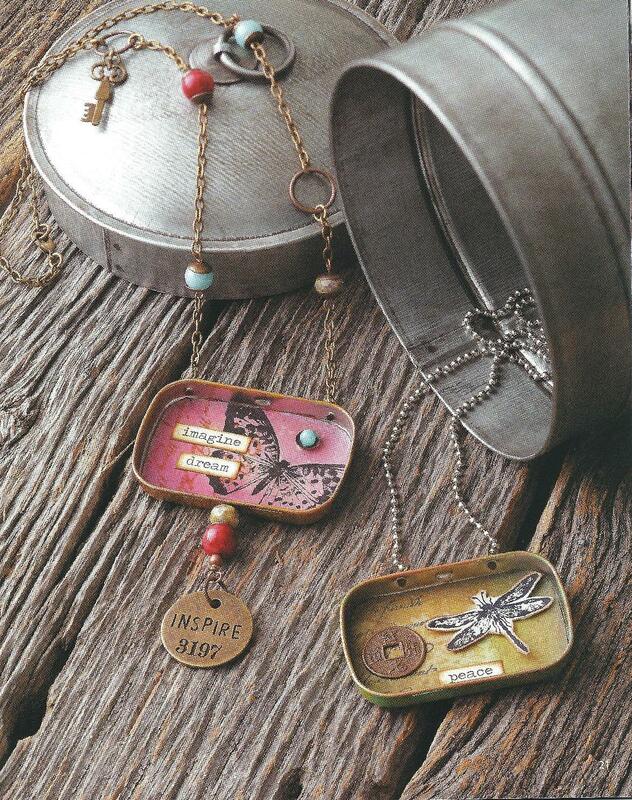 I particularly like the necklaces made from sweetie tins and simple stamping techniques. The projects are beautifully photographed and the instructions have accompanying images to make them as clear as possible. 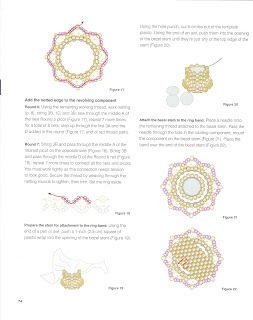 You’ll also find a reference at the back of the book, explaining all the jewellery techniques required which helps to keep the project instructions as uncluttered as possible. My only slight criticism of this book is that the materials lists for projects are rather long — you could find yourself searching for a while for some of the specific components. However, try substituting some of the supplies with similar products you have in your stash for a similar overall effect and don’t be afraid to mix ideas from different projects to suit the supplies you already have to hand. Here’s a variation on the cork bracelet I made using a Prosecco cork and a Rioja cork from the collection I keep in a pot (they come in handy for all sorts of things!). The 'Leap' connector is made using a J-Lynn Jewels decoupage disc. The watch faces are from a job lot I bought on Ebay a while ago, simply stuck to cork slices. The pretend typewriter keys are made using clock charms with domed stickers adhered to them (the stickers came from Home Bargains discount store!). The cogs are from Big Bead Little Bead and the verdigris patina padlock charm and donut bead are from the range of Greek Metal components at Smitten Beads, as is the flower cog bead. I don't remember where I found the little keys or clasp but I'm sure you can find similar online. And btw - the secret to turning cork slices into connectors? Tiny brass picture loops which simply screw in! To enter into the draw to win, simply comment on this post and tell us the most unusual component or technique you’ve used in a jewellery piece. Look out on our Facebook page for a second chance to comment and win! We will pick a winner at random on Monday 4th April after midday and announce on our Facebook page. 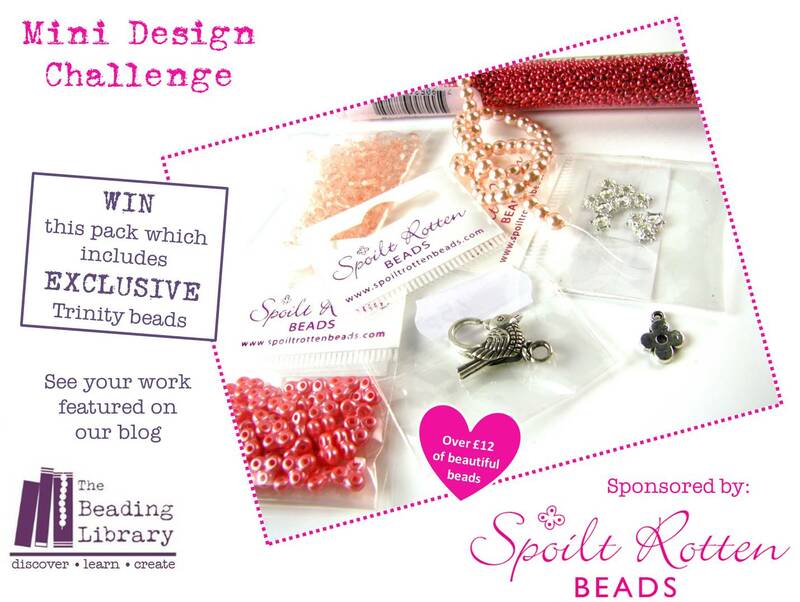 Our second Mini Design Challenge pack was provided by Spoilt Rotten Beads. To coincide with Valentine's Day, the pack contained a beautiful selection of pink and red tones beads including the new Trinity beads. 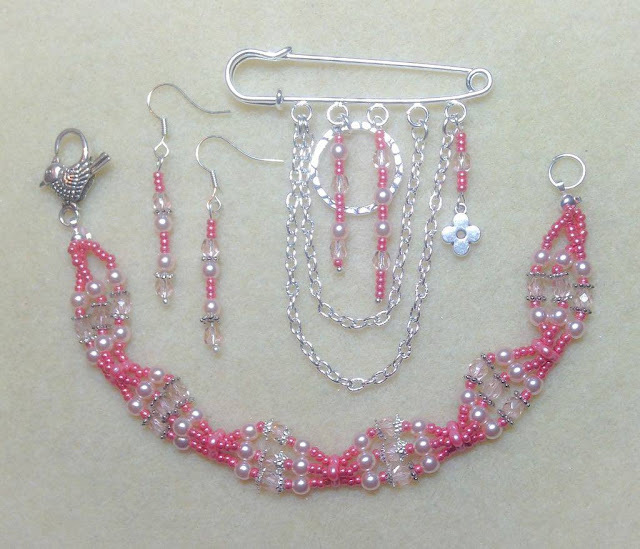 In addition to these three-holed beads, our winner (Lindsay Rowan) also received seed beads, glass pearls, crystals and a rather lovely bird clasp. Lindsay told us "it's been so much fun to see what I can come up with and the selection was lovely. A great mix of shapes, sizes and shades!" Lindsay has very kindly written up instructions for making the three designs she came up with. Lindsay says "I love the complimentary colours in this one – I added the silver spacers to create consistency from the outer sections to the inner. The Trinity beads were great for creating some structure and the seed beads (I love a seed bead!) 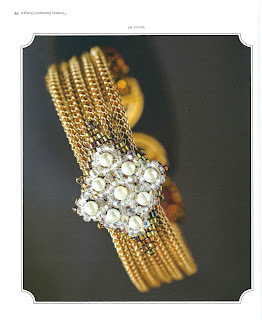 allowed for some movement which resulted in a really wearable, lightweight bracelet that sits flat on the wrist." 1. Cut three lengths of neutral or pink Nymo (I went for a baby pink), each around nine inches long. 4. Repeat this process for sections three and four but replace the spacer beads with beadcaps for section 3 then revert back to spacer beads for section 4. 5. String the final section (five) as per step 1 but in reverse, and omitting the Trinity bead (the one completing the previous section will suffice). 6. Repeat the process for the two other lengths of Nymo noting that no further trinity beads need to be added. Simply thread through the remaining holes on the trinity beads already in place as you reach them. This will build the triangular structure. 7. Knot each end of the bracelet securely and cover with a silver calotte. Attach a jump ring to one end and a smaller jump ring plus the trigger clasp to the other. Your bracelet is complete! Lindsay says "I added some bits and pieces to the beads for this one, namely silver chain and a silver link ring (attached with small jump rings) to add some detail and different textures while still allowing (hopefully!) 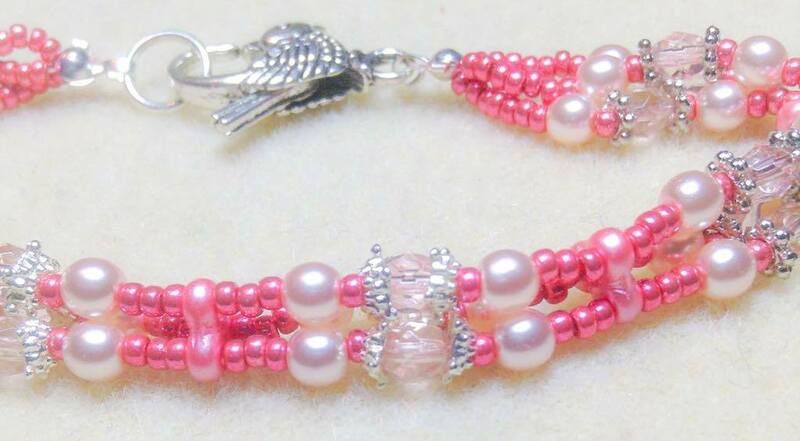 the pink beads to stand out as the colour focus. 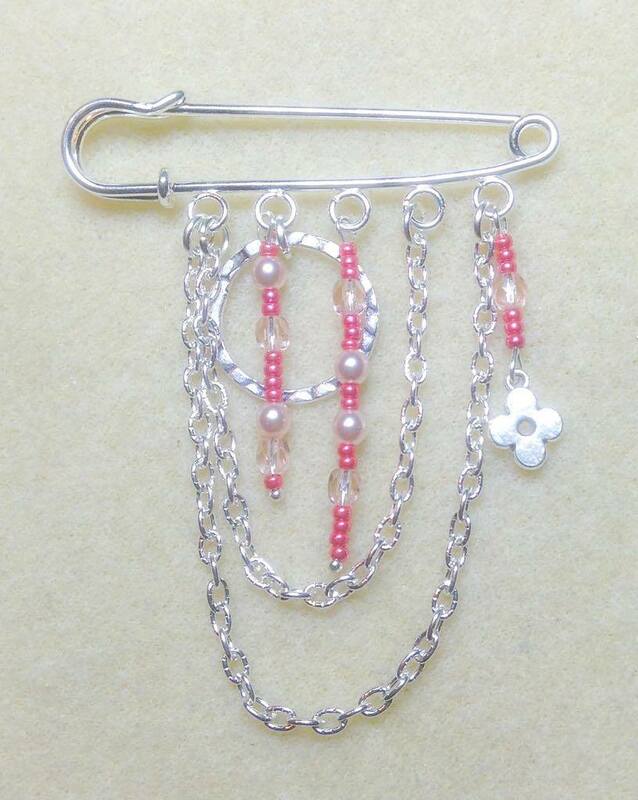 The headpins and flower charm add some movement as well so all in all I’m pretty pleased with this one". 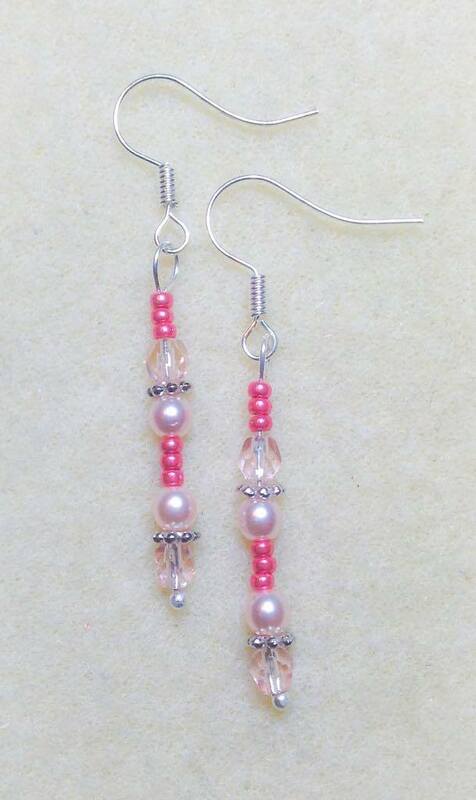 "I opted for a simple, single-strand drop earring for these. I wanted to let the colours speak for themselves with just a hint of silver from the spacer bead (added from my own stock) to set the crystals apart. The head pins have a ball-end finish to give a balancing glimpse of silver. These are also loosely attached to the ear wire to allow for movement again, letting the light catch the crystals." 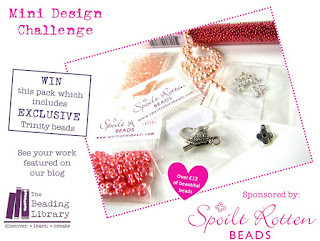 You can purchase all the beads included in the pack from Spoilt Rotten Beads. Look out for our next Mini Design Challenge on our Facebook page. 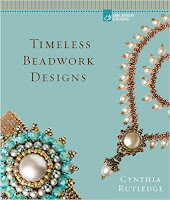 It is hard to believe that this is Cynthia Rutledge’s first book, as she has been a name in the beading world for many years. 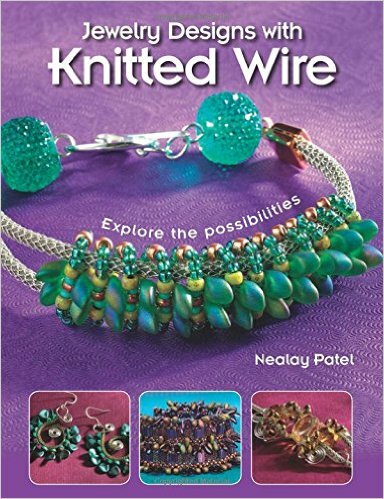 This book, aimed at intermediate to advanced beaders, is most definitely worth the wait. 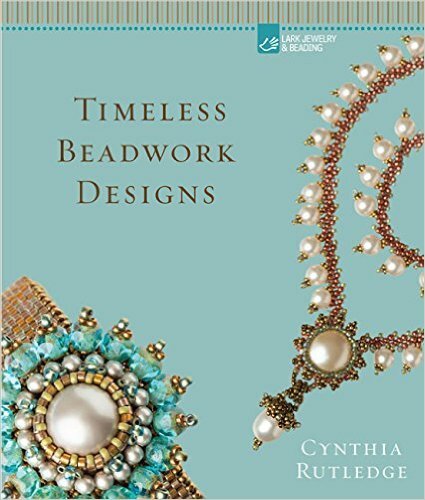 With inspiration taken from beautiful historical paintings, the fifteen projects in this book have a classic timelessness that will appeal to a wide range of beaders. The designs in the book use a combination of seed beads, cylinder beads and pearls alongside faceted beads and crystal rondelles. 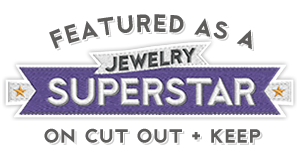 The Cubic Zirconia stones and settings that are used are a little harder to come by, but are available directly from Cynthia Rutledge’s website. A web search reveals that a limited number of stones are available from UK suppliers too. that you normally find with a traditional odd count peyote turn. I found the instructions and diagrams for the projects to be very clear, with every step well described and illustrated. I did find the working sequence to be slightly out of order to the way I would have done the piece, as at one point I had three half finished components on my beadmat, with all of the associated thread tails. By altering the order in which the components of the ring were made, you could have worked the pieces and finished them off as you were going along. I did substitute the CZ stone in the ring for a 10mm rivoli that I had in my stash, and it seems to work as well as a CZ for this design. I’m not sure if it would work as well for the other designs - but I can’t wait to find out! 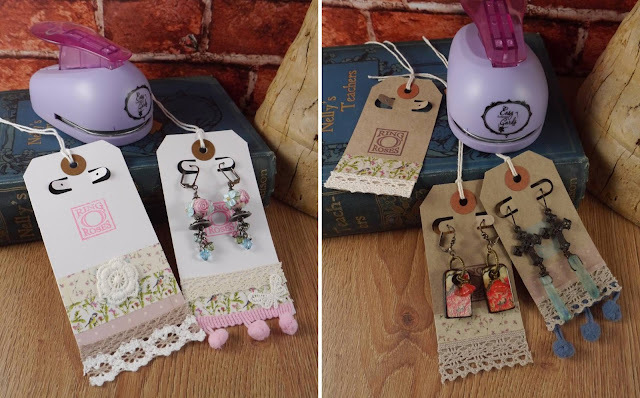 I was browsing a US craft blog a couple of months ago when I first came across the Easy Earring Cards – Punch Kit from Packasmile. Being a papercrafter, I have a wide selection of design punches and could see just how useful one for earring cards would be. I quickly got in touch with the lovely folks at Packasmile to find out how I might get my hands on this innovative product. So, the first thing I should tell you is that the Easy Earring Cards range isn’t just about punches. The products available include card blanks in various designs, some clever little card convertors that enable you to hang your earring cards, and cello sleeves or unique ‘pouchelopes’ for popping your cards into at craft fairs. Putting the punch to the test! The kit tested here includes two punches — the Leverback Punch and the Double Post Punch. In addition are 25 Antique Tan Earring Card Blanks. The Leverback Punch is perfect for mounting earrings with lever-back, kidney, fish-hook earwires. 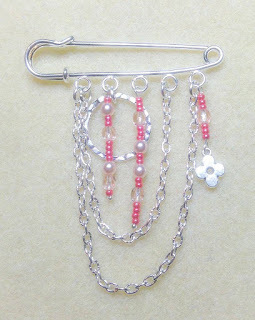 It can also be used to display pin brooches. It punches approximately 3/4 inch from the edge of the card. The punched area is approximately 1 1/2 inches wide and approximately 1/4 inch in length. The Double Post Punch is designed for use with stud earrings, fish-hook earwires or even bobby pins! It punches approximately 3/4 inch from the edge of the card and the holes are around 1 inch apart with a diameter of 1/16 inch. Both can be used with pretty heavyweight cardstock (around 100lb/270gsm for the Leverback Punch and 80lb/215gsm for the Double Post Punch). Both can be sharpened using alumimium foil as with most paper punches. Oh and they even come with a 1 year replacement warranty! As soon as I opened my overseas package, I was struck by the weight of the box. The two punches are lovely quality and heavy weight. The Double Post Punch is the smaller of the two and both have a cover underneath to catch the cut-out card. There is a mark on the plastic casing to show the centre, and as long as you take note of this and make sure you push the card blank in the right way around so it is nice and flat against the back plate, punching is easy. Here is my first attempt using the Double Post Punch on the earring card blanks provided. BTW the earrings are Carnelian ‘berries’ on autumnal leaf earring posts and are the perfect length for these cards. The Leverback Punch creates a hole surrounded by a ‘flap’ of card that you can thread your lever-back earrings through really easily. This punch is slightly chunkier and I found it useful to make a pencil mark on the punch casing where the edge of the card blank should sit when inserted. It ensured the holes were centred and consistent. 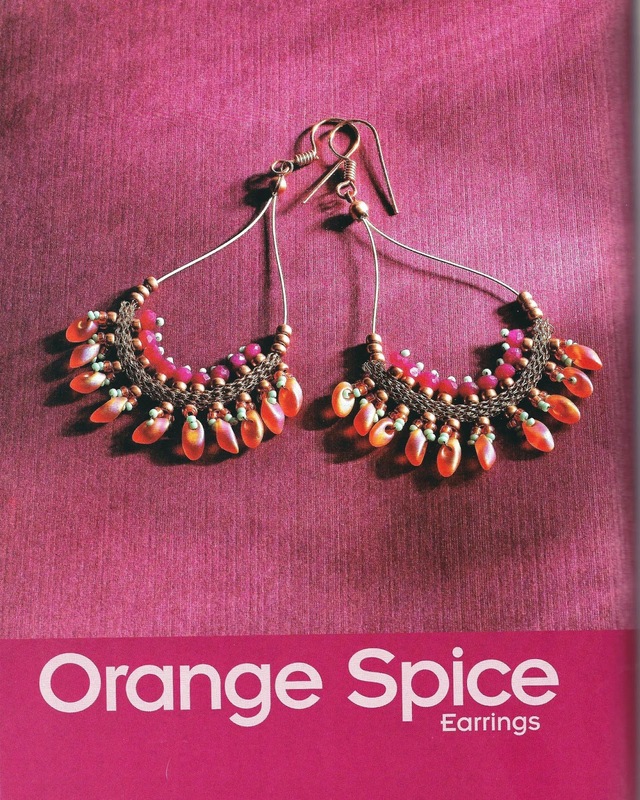 These earrings were a pair made for a 'Recipes for...' feature for Beads & Beyond magazine in May 2015. Once I’d mastered the use of the punches on the blanks provided, I was ready to have a go with my own business cards. When I designed my biz cards, I went for a vertical orientation specifically so that I could also use them as earring cards. Up until now, I have used a ‘Crop A Dile’ punch tool to make two holes in them for fish-hook earrings and studs. For lever-back findings, I have been using a small length of ribbon threaded through the holes to attach the earrings. Quite a pretty solution but not the best way to display the earrings as they would be worn. One of the advantages of the Leverback Punch from Packasmile is that the little tabs created can be bent forwards to better display your earrings. Here are the cards I made using my business cards. My earring cards get the works! The last few weeks, I have been coming up with new ways to display my jewellery for a retail space. A visit to The Works website gave me lots of inspiration including various tags with string cords, perfect candidates to be punched as earring cards. These craft card shaped tags, simply stamped with my logo are great for my earrings using Fallen Angel Brass findings. These lighter weight label tags are called Spring of the Farm. The cords are great for hanging the cards from display hooks too. The Works also had a huge range of Washi tapes, lace trims and embellishments, oh and some cute pompom trim in blue and pink! I ordered some white and brown craft luggage tags from Ebay to use with these for a romantic, vintage style. These tag cards are just right for longer earrings too! Overall, I am really impressed with the punches and will definitely be using them with both luggage tags/labels and my own business cards in the future. They are really well made and look like they will go the distance. They will add a touch of professionalism too! For now, you can order the punches separately or as a kit from www.easyearringcards.com. The Double Post Punch is $19.99 and the Leverback punch is $21.99. You can buy the kit with earring card blanks for $44.99. All products ship with USPS Priority Mail. Obviously, you will have to consider customs charges for shipping these products into the UK. Display Inspiration Series:3: You've been framed! If you were a regular reader of Beads & Beyond magazine you are probably familiar with jewellery artist, Nealay Patel. His sculptural pieces take small beads, beading wire and both hollow and flat knitted wire to new heights and he is always finding new ways to use components to great effect. This book focuses on the design opportunities afforded by four key products from SilverSilk — hollow knitted wire, capture knitted wire, flat knitted wire, and leather knitted wire. Take a look at the SilverSilkwebsite for more detail on these. You may already have used SilverSilk products as a luxurious stringing option for your jewellery but Nealay shows how versatile they can be acting as a stitchable framework for more extravagant pieces. 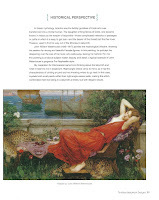 The book begins with an in-depth introduction to all the techniques tools and materials required to complete the 32 projects contained in its pages. 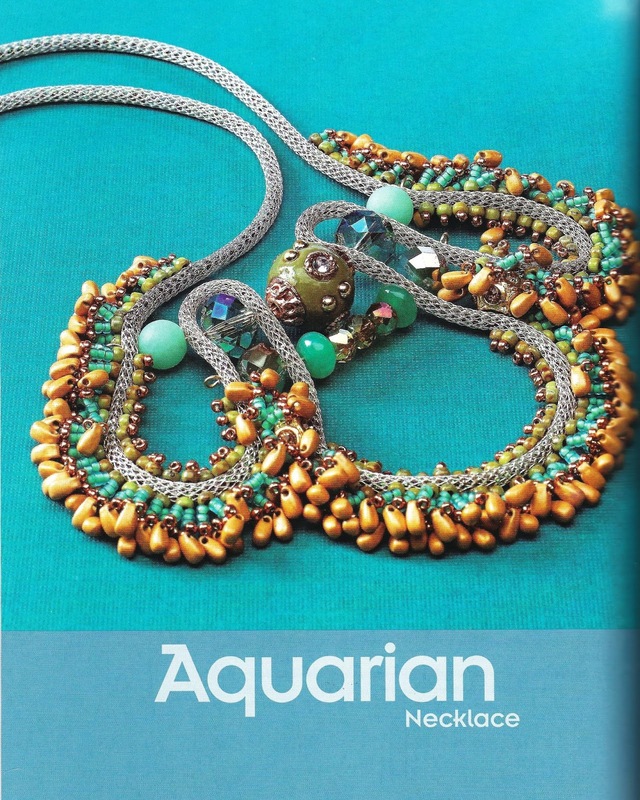 This includes a summary of all the different bead types used and an introduction to the SilverSilk line of products. The projects are all decadent and dramatic designs (as we come to expect from Nealay!) 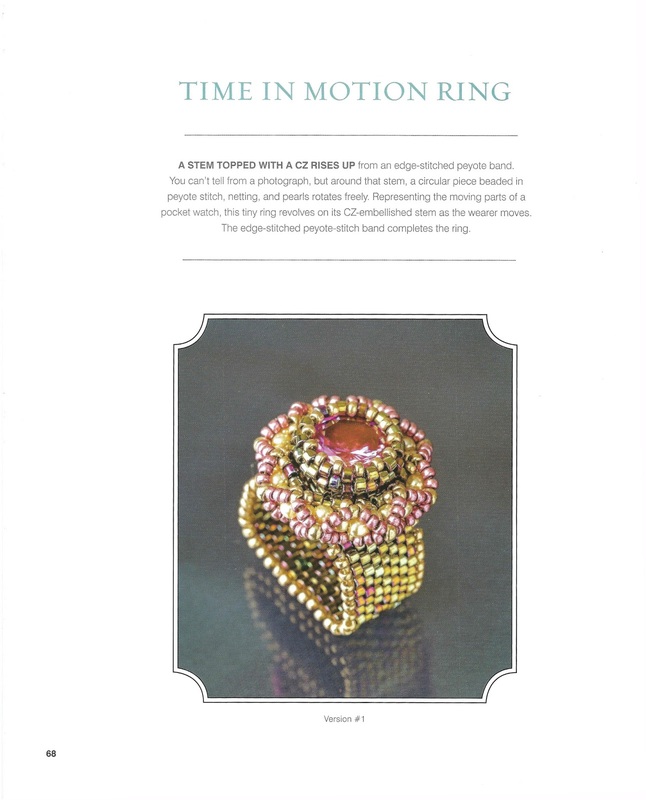 and each is beautifully and colourfully photographed to showcase the beads and knitted wire. The comprehensive materials list appears in the right hand margin along with a techniques reference which is really useful. For each piece, page numbers are listed where you will find more detail on the techniques required. Whilst the project instructions do not have photographs for each and every step, there are images that accompany the more complicated aspects of the project and, as previously mentioned, references to the introduction for further instruction on specific techniques. There is a wonderful mix of pieces from statement earrings to beautiful bracelets and both long and short necklaces. 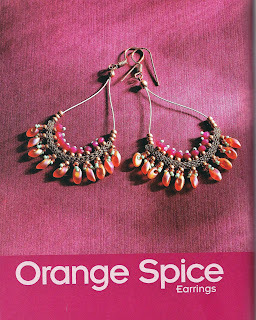 We particularly liked the Orange Spice earrings pictured with their fruity colour tones and great use of long magatama beads. 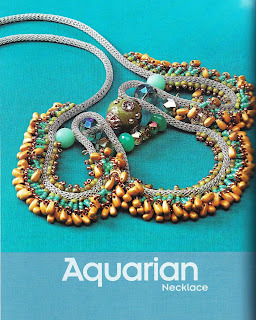 The Aquarian necklace is mixes metal finishes with Silversilk Capture in Pearlesque Silver and long drop beads in matte yellow gold. The use of beads in each project is delightful and the combination of colours teamed with varied finishes of knitted wire make for some original and striking designs. Whilst many look extremely intricate and difficult to achieve, Nealay succeeds in showing how a wire jig and some simple stitching techniques can be used to create them with ease. 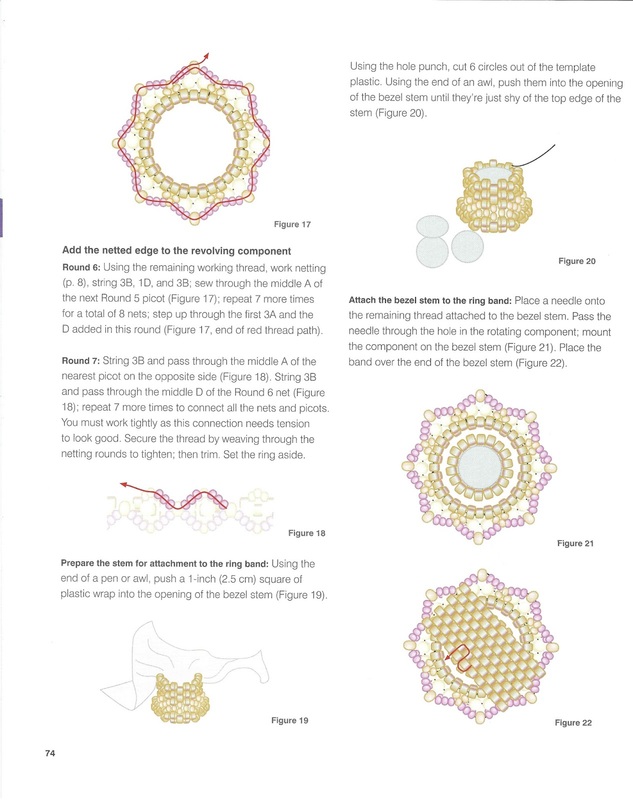 If you are looking for opportunities to extend your bead stitching skills and broaden your horizons in terms of the bead shapes you use in your pieces, then this is the book for you. My only criticisms of the book would be that a list of suppliers for the materials and tools used would have been useful, perhaps at the back. I also would have liked to see a few more projects using the flat knitted wire (there are only four in the book). Find out more about Nealay on his website. We have a copy of Nealay’s book to give away. Comment on this blog post and you could be in with a chance of winning! Comment on our competition post pinned on our Facebook page and you can get a second entry!